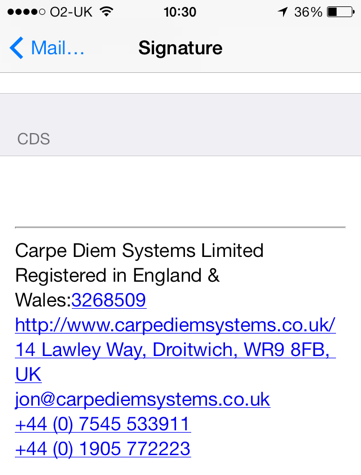 iOS mail signature woes – Carpe Diem Systems Ltd. This morning I decided to update my company email signatures and synchronise them between the MacBook Pro (Mavericks), the iPhone and the iPad. A couple of hours later I finally cracked it! 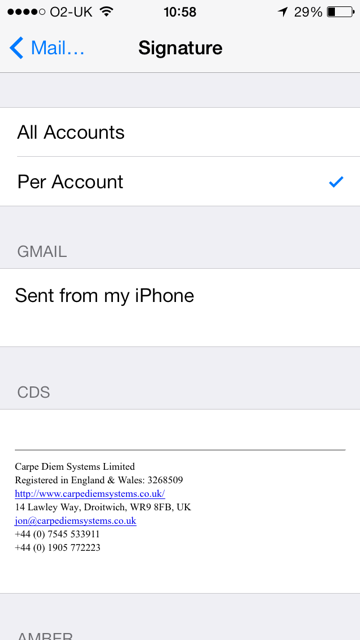 The main issue I had was preventing iOS from automatically converting numbers and addresses into links. This is a particular problem when it gets it wrong and doesn’t provide any obvious means of editing/cancelling the links. 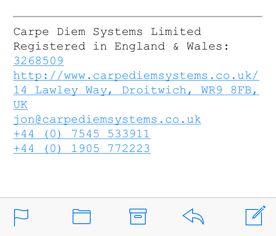 In this case just the company number was displayed as a telephone number link. 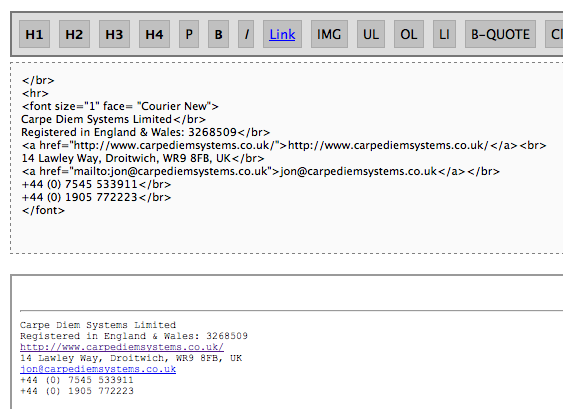 But on one of my other email accounts half of the address was converted to a link while the other half remained as text. I don’t think it’s possible to suppress this automatic conversion, and I can live with it because usually it works quite well. So, the copy and paste has worked, but it’s not what I want. I’ve lost the font type and size, and nearly everything is blue. 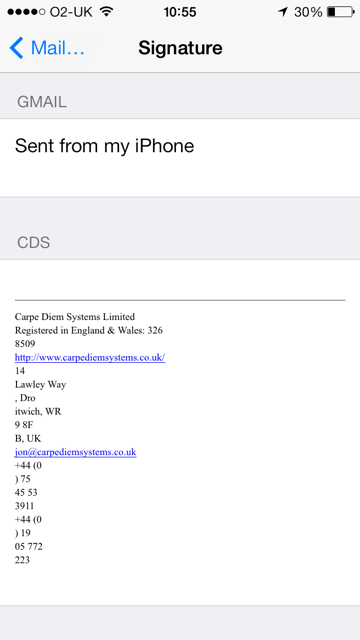 I then tried using the online HTML editor on the iPhone but the rendered output had automatic link conversions on the telephone numbers. Not really a problem but it was still doing things I didn’t want. 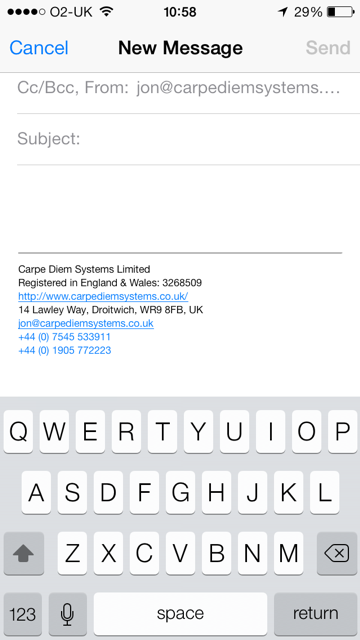 Then I copied the message to the iPhone’s email signature editor but it lost the font! Ok, so the telephone numbers have been converted into links but I suspect I can never prevent that, and since these are telephone numbers then I’m fine with it. 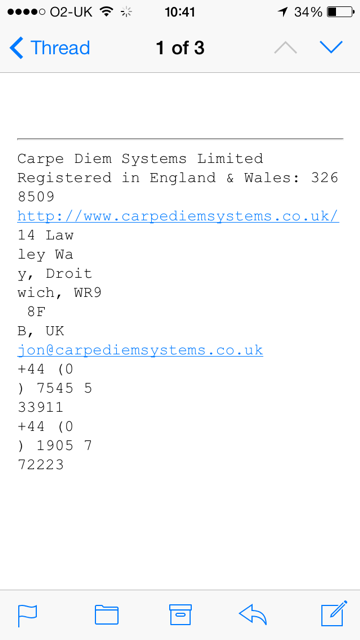 But I’ve got my font type and size, and the company number is just a number (not a link), and I’ve roughly got what I wanted. Then I repeated the last few steps again on the iPad. 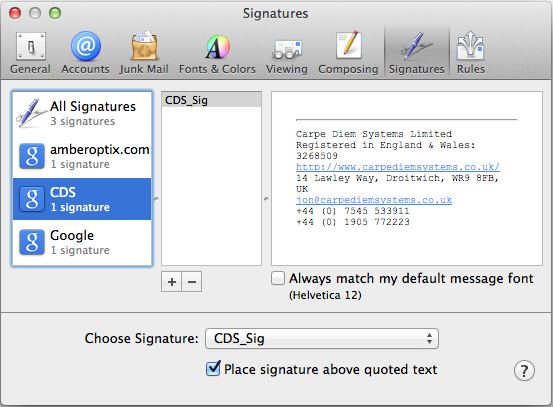 There are plenty of iOS apps for making signatures but I really wanted to have the in-built signature working. And now I have it. But there must be a better way, either now or in the future. And once Apple and Google start talking to each other I might even see emails as they arrive without having to restart the mail app on Mavericks.